Originally, the Monastery was able to support itself well from the farm economy. The sisters also had an ecumenical school and provided important religious and social services, like home health care, for the population. In 1948, the entire land, as well as the buildings of the Monastery in Tsarev Brod, which had been self-sufficient, were expropriated by the Bulgarian government; the German sisters were driven away and the Monastery was changed into a psychiatric clinic. When in 1993, a closer relationship with the EU began, the Bulgarian government started to return the confiscated real estate to the congregation. However, the return included only part of the grounds and part of the monastic buildings. The grounds and the returned buildings have suffered greatly during the confiscation and their use as a psychiatric clinic and are now altogether in a condition which is in urgent need of renovation. The defective installations of the mechanics of the house (electrical, water, and heating systems) are a constant danger for the inhabitants and it is close to a miracle that no one has yet to come to harm. The decentralized heating boilers are harmful to the ecology and financially dissatisfactory because of the high demand of fuel. The same is true of the 18 Electro-boilers in the building and for the decentralized warm water production. The church of the Monastery doesn’t only serve the parish of Tsarev Brod, but also the faithful at Shumen and the surrounding area. It is in a condition which is not worthy of a house of God, since there has been no upkeep for the past 60 years. There is no safety to the roof, electric installation and the heating. 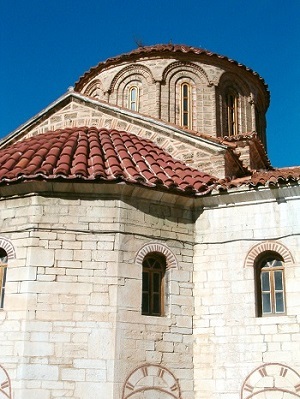 The planned restoration includes renovation of the entrance area through new and additional structures, removal of misfit and useless additions from the communist area, new roofing of the church, Monastery and Guesthouse. We also plan to erect a building for the central heating system of the church, Monastery and guesthouse, completely renovate the heating systems, drinking water and sewage installations, and electrical installations. Establish a sewage system outside of the building with a small, separate sewage plant. We will build a rainwater cistern with a pump for the watering of the garden, renovate and partially reconstruct the interior of the church, living quarters of the sisters will become appropriate for a monastic standard and new and functional arrangement of the rooms which are necessary for the religious life.